This dish absolutely hit the spot on a cool early fall evening. The gravy is the absolute bomb. It would be great on any dish where you need a mushroom gravy. I prefer to make my pork medallions in mushroom Marsala sauce in a large cast iron skillet, finishing it off in the oven. The cast iron gives me that great sear, while cooking nice and evenly so that the pork comes out perfect. You can finish the pork on the stovetop if you wish, but I really think you’ll get a much better, more even, cook in the oven. And it really doesn’t take long at all. Just try resisting spooning out some of the gravy while it’s cooking. You’ll want to get yourself a taste. And then some. Also try my slow-cooked mushroom pork tenderloin. Cut the tenderloins into 2" rounds. Flatten slightly and season with salt and pepper. Heat the oil and one tablespoon of the butter in a large oven-proof skillet (I prefer to use cast iron for this). Get the oil as hot as possible without smoking. Add the pork and sear on both sides, 2-3 minutes per side. Remove to a plate. Reduce heat to medium and add the remaining butter to the skillet. Melt. Add the shallot and a pinch of salt and saute for 30 seconds. Use a flat spatula (a wooden spoon works great) to scrape up any yummy bits stuck to the bottom of the pan. Add the mushrooms and saute until golden brown and the moisture is released and evaporated, 5-7 minutes. Sprinkle with salt and the flour. Slowly stir in the Marsala until it is nearly evaporated. Stir in the chicken broth. Reduce heat to a simmer and let simmer until reduced by half. Stir in the cream and parsley. Add the pork and any accumulated juices back to the pan. Place in the oven and cook until the internal temperature reaches 155-165 F.
Serve pork with plenty of the gravy and mushrooms. 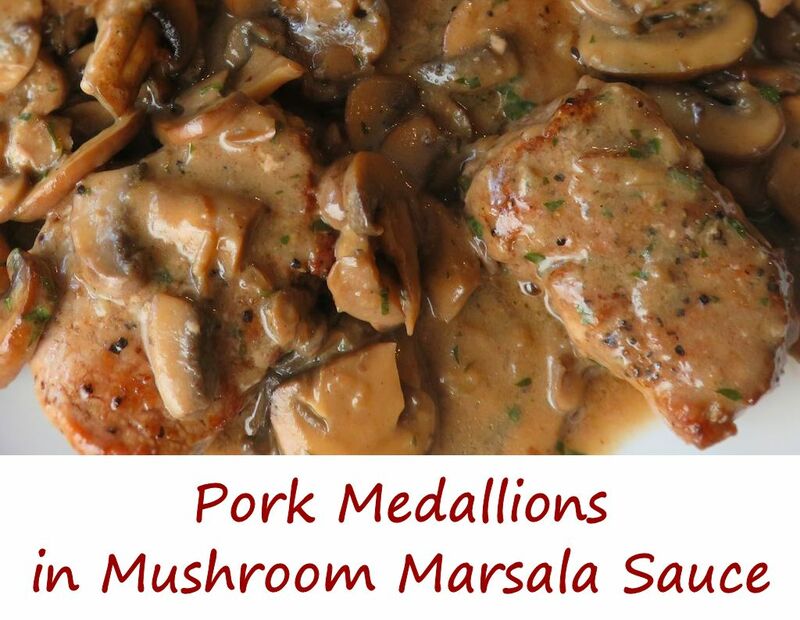 This entry was posted in Main Dishes and tagged mushroom marsala sauce, pork medallions, Pork Medallions in Mushroom Marsala Sauce, recipe by Mike. Bookmark the permalink. OMG this was the BEST recipe ever. I’m sitting here with my fingers on the keys of my laptop trying to think of what to say but all I can say is that this is the best pork tenderloin recipe I’ve ever made. And I’m a die hard pork tenderloin person.